The junior ratings of the engineering branch on conventional submarines dwelled in the After Mess, popularly know as the 103 Club after the bulkhead behind which it is situated. 17 men crammed into a space that would make a smallish downstairs toilet in suburbia, it was very cosy at meal times when some of the bunks were folded away to make seating. Not all the bunks were in the actual mess, some were right aft by the stern torpedo tubes. This was known as the swamp, probably due to the wing bilges which always had a liberal amount of hydraulic oil and water swilling about, and the vaguely animal noises from the after planes and rudder. When I joined Opportune the stern tubes were still nominally used to fire counter measure Mark 20 torpedoes, but most of the time they were used to store crates of beer. A bunk in the swamp was to be my refuge when I first qualified, before that I'd graduated from a hammock in the fore-ends to an actual bunk in the Fwd Mess. The bunks themselves were not particularly commodious, I remember showing a lady around during Navy Days, "What are all these shelves for?" she asked. We slept in our working clothes in case any emergency should require immediate attention, our bedding was a sleeping bag and we weren't allowed to wash most of the time due to water restrictions (all the fresh water belonged to the Chief Stoker and he guarded it jealously); the atmosphere was ripe. Despite the water restrictions, there was always plenty for scrubbing the decks. The more junior you were the less likely it was that you had sole tenure on a bunk. Hot bunking was common, so when you rolled out of your 'pit' to go on watch, someone coming off watch would roll into it, lovely! It's hard to imagine living like that nowadays, but it was amazing how quickly one adjusted. There were usually games played before meal times, cribbage, uckers (a nautical distant cousin to Ludo with complicated and savage rules), fives and threes (dominos) or 'chase the pisser' (find the lady). The meals came from the galley which was some way forward, we took it in turn to go and collect them, balancing five or six plates, separated by plate rings; a precarious business in rough weather. The journey back was even more difficult if the boat was at periscope depth in the evening or early morning, there were double blackout curtains at both ends of the control room as the control room would be in blackness. Often sausages would go missing and once a horrible Welsh stoker handed me a sausage that I'd 'dropped'; to my horror I realised that sausages weren't on the menu that morning! 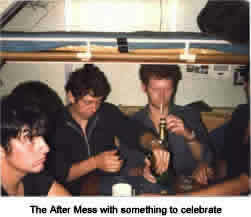 It was an unwritten rule that submariners didn't drink at sea, a rule observed by the overwhelming majority. The only exception was Channel night, the last night at sea before returning to base. As an electrical mechanic or greenie (after the green stripe electrical officers once wore on their sleeve between their gold rings) my part of ship was the motor room. Pay attention, here comes the technical stuff. In the motor room, besides the huge motors which propelled the submarine and other, smaller, motor-generator sets, were the switchboards. There were three switchboard arranged as a box with the port side open. The propulsion switchboard translated the telegraph orders from the control room into ahead or astern movement, this was in front of you as you looked forward, the generating switchboard, to your right, controlled charging the main batteries, and the auxiliary power switchboard, behind you, distributed power of various voltages and hertz throughout the submarine. This was where I kept my sea watches. Depending on the operational circumstances watch keeping could be either hectic or quite relaxing. Snorting definitely fell into the hectic definition; propulsion orders would be coming thick and fast as the planesman and officer of the watch struggled to keep the boat at periscope depth, the engine room would be starting and stopping the donks as the boat rose and dipped. If your watch-keeping buddy was off taking a battery dip there were times when you needed more than two hands; hardest job in the world, motor room watch keeper! On the other hand some watches could pass with very little incident. Spud Murphy always had a project on the go for the quiet watches; everything from carving a decorative lamp post to adorn the casing during port visits to decorative knot tying. I learnt knot tying off Spud and have become quite proficient at it — for a greenie. 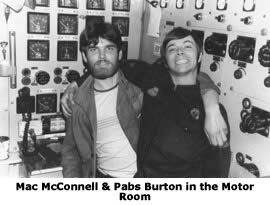 The motor room worked closely with the engine room. There was a closed circuit tannoy system between the two, the donkshop boys wore ear-defenders with radio receivers in them so as to hear both the motor room and the main broadcast system when the engines were running. The great joke in the motor room was to change the two microphones over so that the unsuspecting would be chatting away to the boat in general when they thought they were communicating solely with the donkshop. The command was less than pleased to be told to "eff off, you ****ing clanky w****r!"